It has long been touted as the route to clear skin, good digestion, and weight loss, but is lemon water really the health wonder that it’s made out to be. Since Ancient Rome it has been used to benefit health, and it continues to feature in most detoxes and weight loss regimes. Lemons are full of vitamin C, potassium, magnesium, and copper. They also contain some B vitamins and fiber. And they really provide you with some excellent health benefits; not bad for a fruit that was once just used as a decorative plant. Lemon juice is similar in structure to the digestive juices in the stomach. It makes the body produce bile, which keeps the digestive system running smoothly. Lemon water can relieve indigestion and an upset stomach. Lemon water encourages the body to absorb nutrients from the food better. It stimulates the liver, so toxins are eliminated more efficiently. Its mild diuretic effect also speeds up the elimination of waste. Vitamin C boosts immunity and protects the body’s cells from oxidative damage. It can also prevent colds and flu, or at the least, reduce their severity and duration. The vitamin C content in the lemon water fight free radicals which contribute to skin ageing. It also helps boost collagen production, which helps keep the skin plump and wrinkle-free. A study in the American Journal of Clinical Nutrition found that vitamin C consumption led to younger looking skin. Lemons contain pectin, which is a type of fiber. Fiber keeps you feeling fuller for longer so you’re less likely to be inclined to snack. Lemon water also keeps you hydrated, which will stop you from mistaking thirst for hunger. Our bodies get their energy from the molecules and atoms in foods. Negative-charged ions, like those in lemons enter the body and naturally boost energy. Studies have found that even the scent of lemons can boost mood, reduce stress, and increase alertness. Vitamin C keeps our immune system healthy, and vitamin C is easily depleted when we are stressed or when our lifestyle is not as healthy as it could be. Lemon water boosts levels to keep everything running as it should be. Potassium is needed for a healthy heart, as well as for normal brain and nerve function. 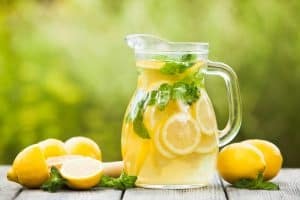 The lemon water can get rid of less than fresh breath, plus it’s said to relieve toothache. Caution is needed though, as the citric acid in lemon can wear down your protective tooth enamel. Don’t brush your teeth after drinking lemon water. Inflammation in the body is the cause of most diseases and illness. Lemon water combats inflammation, so it may be helpful for people who suffer from joint inflammation and inflammatory bowel disease. Try replacing your morning coffee with a cup of warm lemon water and you should find that the mid-afternoon crash disappears and you will feel less jittery. The boost to immunity due to the vitamin C and the soothing effect of the warm lemon water helps to ward off sore throats and viral infections. Opt for organic fruits where possible. Don’t choose fruits that are dull, wrinkled or excessively tough. Storing them in a sealed plastic bag keeps them fresher for longer. Prepare lemon water by adding half a lemon to room temperature or warm water. Drinking it in the morning before breakfast will ensure that your body absorbs the nutrients better.